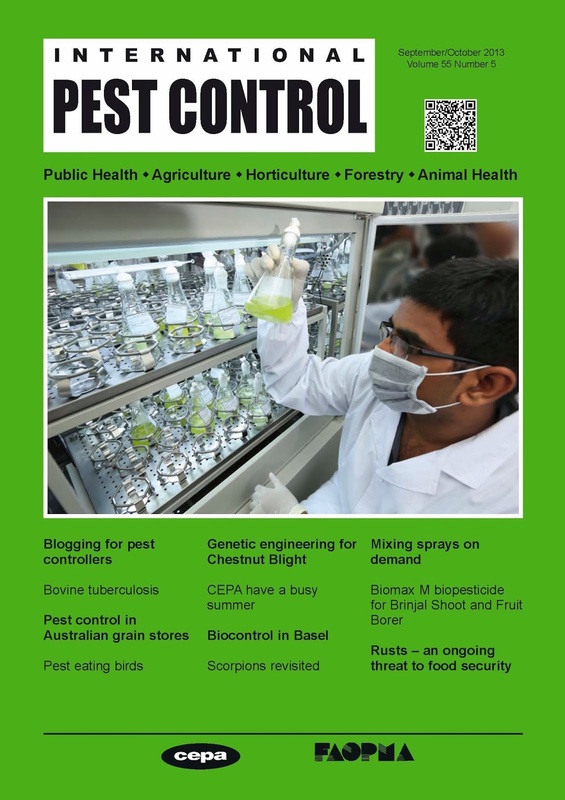 Whichever your pest interest, we have a diverse and broad range of subjects in this issue. Scorpions are not often covered in pest control papers and whilst not a global pest you may encounter these if you travel abroad. Our Technical Consultant Clive Boase provides an insight. In agriculture, rusts diseases make a very significant contribution to crop loss on a wide range of crops globally. with grain storage to minimise pest outbreaks. We also examine Brinjal Shoot and Fruit Borer. The insect is the most destructive pest of brinjal or aubergine, a popular vegetable grown throughout the entire tropical and subtropical regions of the world. We review how a novel biocontrol agent can help reduce pest damage. The UK project to reduce bovine tuberculosis in UK cattle is a subject that spans public health, animal health and vertebrate pest control with politics thrown in for good measure. We provide an overview of this serious disease and look at how the bacterial infection is being tackled in the UK and US. Finally, in the northern hemisphere, autumn is a time of harvests and conferences. CropWorld, PestWorld and ABIM all take place in the coming months, as do several other important regional meetings and events such as the first Parasitec in Morocco and the 21st Pesttech. The IPC Technical Consultants and I will be out and about at these events, aiming to capture the news about recent important technical and commercial development with plans to report back our findings within these pages. Should you have information which you wish to share, please get in contact. We have again updated and extended our rolling calendar of pest control and pest management events. If you see a key meeting that is missing, drop me an email.